Oil Sachet: Rapeseed Oil, Palm Oil, Chilli (13%), White Sesame, Spring Onion, Ginger, Fermented Soya Bean Garlic, Spices, Flavouring. 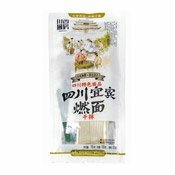 Bean Sprout Sachet: Bean Sprout, Rapeseed Oil, Garlic, Flavour Enhancer (E621, E635), Sugar. Peanut Pack: Peanut (99%), Soyabean Oil. Powder Sachet: Salt, Maltodextrin (Corn), Flavour Enhancer (E621, E635), Flavouring, Sugar, Anticaking Agent (E551). Simply enter your details below and we will send you an e-mail when “Sichuan Yibin Noodles (白家四川宜賓燃麵)” is back in stock!